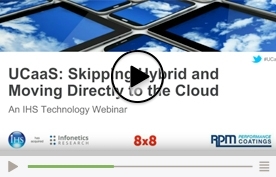 UCaaS: Skipping Hybrid and Moving Directly to the Cloud | 8x8, Inc.
Unified Communications: Go Hybrid or Move to Cloud? More and more businesses across all industries and of all sizes are moving to the cloud for unified communications (UC). 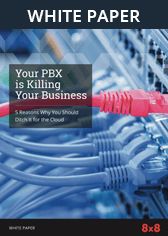 But the way in which companies migrate their communications infrastructure and applications to the cloud can vary. One approach is hybrid – where some users reside in the cloud while others are kept on premises. There are a variety of reasons to consider a hybrid approach, but is it the right path? If moving to the cloud, why not go all in? This webinar explores moving UC to the cloud, the advantages of a full UC-as-a-service (UCaaS) deployment, and the issues a hybrid approach injects into the mix. Learn how companies that have moved 100% to UCaaS have benefited. Telecommunications managers and CIOs within enterprises – small, medium, large, and multinationals. Financial analysts and media are also encouraged to attend. Get the facts you need. Complete the form and watch the video. Click the button below to watch the video.